So have you picked out that special Valentine’s Day card for that special someone yet? If you have not (or if the one you picked out isn’t all that special), I’ve got a tip for you. 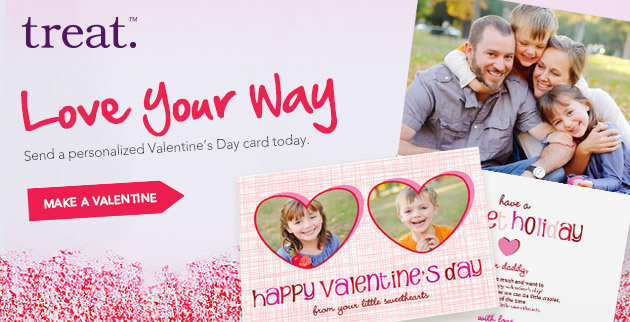 Visit Treat and make a personalized Valentine’s Day card. Like now. Here are some of their most popular cards for him and her. Also, if you need cards for your kids’ classroom, check out their sister site, Tiny Prints, for the best classroom Valentines! If you do so by January 30 and use the promo code 20JANSW you can save 20% on your entire order! Personalizing cards make them so much more special. Awesome sale for Valentine’s day. I really need to get on the bandwagon with getting my own cards made. Such a wonderful idea and so much more intimate than a store bought card. Thank you for letting me know about this (and sales are always full of win as well)! I think these are so special and neat to do.